Fascinating to see how Amazon is determining how a product should be packaged, with Tide launching a new e-commerce friendly pack design. Quite something. Should we all pack up and go home now? Then, of course, once launched, who do you get to promote your new e-friendly look? Well, The New York Times says Nano-influencers – those on Social Media with less than 1000 followers – hello? – are increasingly the go-to’s. If you want to view Amelia’s whole presentation, I’d be delighted to delight you. Just let me know. There are no good or bad habits, only effective ones. James Clear wants us to start noticing what we do in order to amplify those habits that are effective, and discard those that are not. He shows us how to do this using a simple scorecard. This and 4 other suggestion are in Mayo Oshin’s Things to Do When You Have Too Many Ideas and Never Finish Anything. I think I agree with most of them. But I’ve always struggled with the concept of gut instinct. Though my gut tells me that’s probably just me. Then again, one can always just make a brilliant paper aeroplane while we’re working out our effectiveness. It’s 7 years this month since I left my previous job to set up Watch Me Think UK in Richmond, London. Which by pure coincidence is exactly the same month that the mighty pup Fenton (FENTON!) 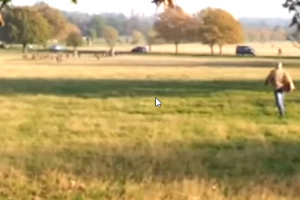 was chasing deer in Richmond Park. Smartphones are pretty central to Watch Me Think existing, so lucky for us the number of users will pass 3bn this year. No shortage of respondents then 😉 These magnificent photos show how smartphones have become such a part of our societies. P.S. We’re always on the lookout for interesting stuff that makes us Think. So if there are things you think we should be reading, or anything you come across that you just KNOW should be in The100, give me a shout. I’d love that.